Kissing movie star Grant West may be every teenage girl’s dream, but when it happens to Sydney Kane, it’s nothing but a nightmare. Sure he’s cute, but having her face plastered all over celebrity gossip blogs is not something she’s interested in. Now cheerleaders are trying to befriend her, reporters won’t stop calling, and her mother keeps chasing her with a curling iron so she won’t be caught by the paparazzi with flat hair ever again. Forgetting Grant is all Sydney wants and Colin, the guy she’s had a crush on since seventh grade, seems like a pretty good way to do it. Then Grant shows up at Sydney’s door begging for a second chance and the more she gets to know him, the more she isn’t sure she wants him to go away. But with Grant in the picture, Colin is backing off and she definitely doesn’t want that. Everything is a mess and Sydney doesn’t know what to do, who to choose, or how to make those pesky cheerleaders leave her alone. 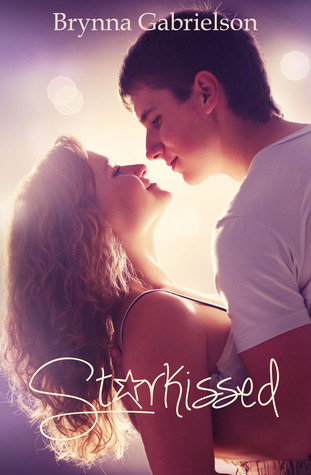 She only knows one thing for sure, being STARKISSED isn’t a dream come true at all. My heart is still beating for this book even after I’ve finished it! If you have been reading my blog posts for awhile now, you know that I love celebrity romance books and just in general, some cliché books. Why? You might ask, and to be honest, I really don’t know. Maybe I like seeing the different ways a common idea is written but either way I enjoyed this book so much to say the least. First, I want to talk about the characters in this book. Sydney’s family annoyed me so much in the beginning which I liked because it really made you feel the emotion Sydney was giving off when she got into fights with them. Sydney has 5 sisters and I hated them so much until the end when I loved them! Some people may not like when they don’t like characters but then the turn out ok, but I do because you really get to see how the characters evolve and get to know them like a real person. Grant was a super sweet book boyfriend and Sydney, I loved when she built up so much confidence at the end of the book. He was very sweet but he didn’t wow me as other book boyfriends have.